Right now she’s using her bionic hearing accessories to listen to Spongebob, dance to “Get Up Offa That Thang,” sing to “All In This Together” from “High School Musical” and read “Junie B. Jones is Not a Crook.” Life is sweet! When children are diagnosed with hearing loss, parents feel grief, anger, anxiety and guilt. Audiologists can help them through these emotions by remembering this: You’re about to tell a family the child they think they know does not exist. Thankfully, our audiologist was kind and straightforward in her diagnosis, and once we were over the initial shock, she outlined the various treatment options available. 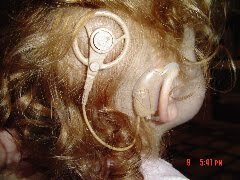 Now that our daughter is 7, hearing with bilateral cochlear implants, and excelling in second grade, those hopes and dreams have returned. We just have to do a little extra planning and coaching. This can be true for all families, regardless of the treatment they choose. * Show sensitivity when delivering the news; don’t just blurt it out. * Explain in layman’s terms the type and severity of loss and what it means. * Give parents a chance to recover from the shock before telling them about treatment options. * Offer information on support groups for parents of children with hearing loss. * Offer a complete list of options when it’s time to discuss treatment. From ASL to hearing aids to cochlear implants to Total Communication, any and all options available and appropriate for the type of hearing loss should be discussed. * Put families in contact with someone who can help them navigate insurance, approval and Early Intervention issues. * Offer contact information on other families who have been through the same situation. This is an emotional time for families, so anything you can do to make the journey forward a little easier will be appreciated.